We long for art which engages the active intelligence of spectators with something compelling to grasp, which fascinates their gaze and calls for sense to be made, whilst resisting any easy facility of that 'sense'. Psychoanalysis suggests that we come to sense out of darkness by the process of our initiation into the world through obscure and enigmatic signifiers (words and images) whose meanings we struggle to interpret.1 An enigma is different from a riddle or a mystery for which there is an answer or explanation; as the French psychoanalyst Jean Laplanche says, enigmas are "opaque to recipient and transmitter alike".2 This is consequential for art as artists are not in complete control of the significations of their images. These significations can by themselves provoke enigmas as much to the artist as to others. The most valuable way to think about Capurro's films is with reference to the history of photography. Instead of taking a still photograph, Capurro has chosen to inject time into the image by using the video mode on his handheld iPhone camera, and, in doing so, enhances the transience of the image. Photography, with its roots in the camera obscura, was always an ambivalent alchemy, transforming the mundane into magic through the 'eye' of the camera. Early photography and film retained that ghostly or spectral magic in the image, but as Walter Benjamin observed, with technical refinement that aura declined: "advances in optics made instruments available that overcame darkness entirely and recorded appearances like a mirror".3 Today in our everyday dealings with photographic images we take the verisimilitude of that mirroring for granted: Benjamin saw this as decline. Capurro puts the magic back into the image as we peer 'through a glass darkly' reviving photography's uncertain and uncanny character, its relation to the 'death that survives it'. 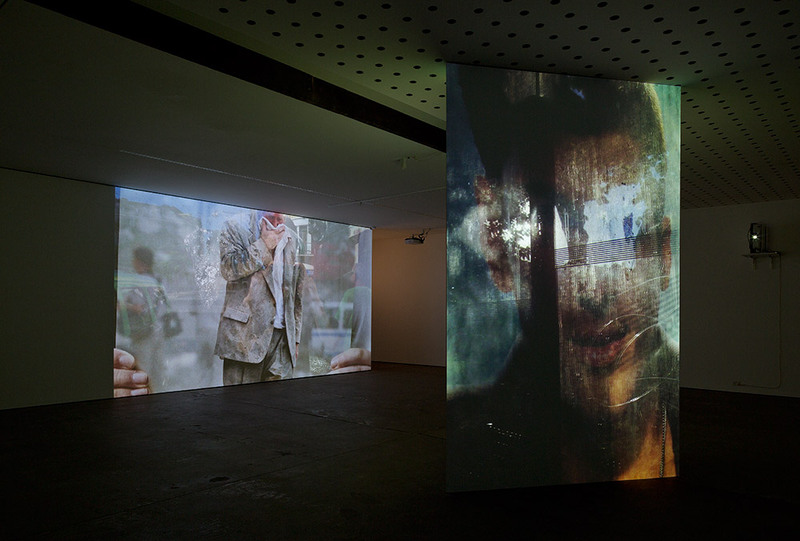 In an interview the artist speaks of the ambiguous space of spectatorship: "The troubling of spectatorship and immediacy, an ambivalence with regard to being in the presence of something," the space of transmission; the transmission of a body, a body of light from one place to another; and he cites Jean Louis Schefer who wrote in relation to the image of the 'thickening' between himself and his subject.4 Capurro's actions are devoted to the uncanny experience of opening up the enigmas of spectatorship: perception, transmission and representation. I am thinking along the lines that these works, rooted as they are in the history of photography and its technologies, are engaged in acts of resistance to what Benjamin saw as photography's decline through its obsession with mimesis. With this latest technological tool, noted for its portable ability to capture instantaneously the exceptionality of an everyday moment, Capurro seeks a reversal of the forgetting Benjamin lamented. 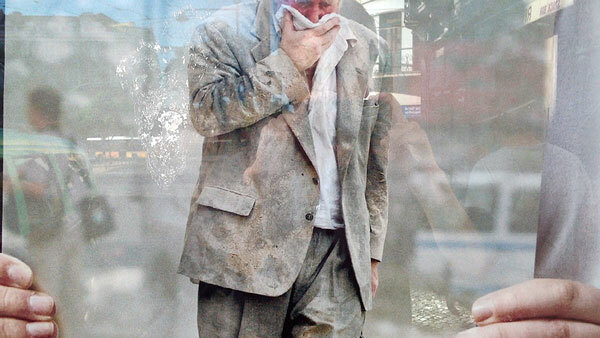 Filmed through the simultaneously transparent and reflective surface of a street window, a memorable image of a besuited man in the dusty aftermath of catastrophe (9/11) reminds us of photography's relation to the historical relay of images that constitute memory; how for Walter Benjamin, history as a perpetual "state of emergency [...] corresponds with the photographic event" written from the perspective of disaster and death: "The past can be seized only as an image which flashes up at the instant when it can be recognised and is never seen again. 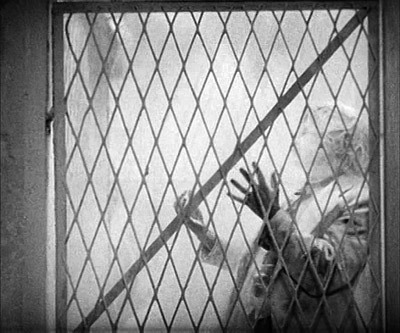 "5 Capurro's appropriated image of the dust-laden man recalls an image in Dreyer's Vampyr: the death of the vampire trapped under a shower of mill flour. 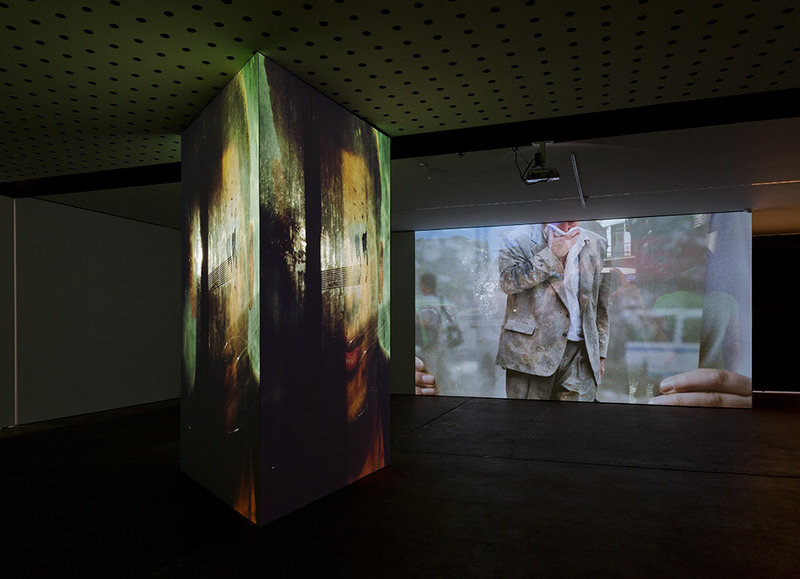 This scene which in Paul Smith's words Jean Louis Schefer devotes a 'conceptually very complex passage' to in his essays on cinema, Smith sees as related to Schefer's understanding of the death, "decay and deliquescence" inherent in the cinematic image.6 A triptych of films at the centre of this exhibition shows an image of a sensuous young man--an ephebe--hovering semi-obscurely but glowingly in the midst of silvery reflections, simultaneously inviting and frustrating our gaze: a photographic paean to the full blooded ephemerality and evanescence of youth. On a monitor in a room on its own, is a head-on, eye-to-eye confrontation with old age's ability to face scrutiny with equanimity. At times the eyes of the subject, "who feels he is becoming an object",7 look into the camera straight forwardly, at others they blink, appear focussed meditatively within, sometimes shooting off sideways. This collection of gaze, glaze and glance reflects our own responses as spectators. Through them we are invited to contemplate the illuminating liveliness of film and photography, and ultimately, since the recognitions of Benjamin and Barthes, also their pact with mortality, their date with decay, deliquescence, and death. 11 Victor Shklovsky, quoted in Lawrence Crawford, "Viktor Shklovskij: Differance in Defamiliarization", Comparative Literature, Vol.36, No.3 (Summer, 1984) p.210. Roger Cook* is an art historian who retired in 2005. Since then he has been an independent scholar. His latest publication on Agnes Martin 'A Doorknob in the Desert: Agnes Martin's Queer Becoming' is forthcoming in the new British Journal of Contemporary Painting: Autumn 2015. He recently gave a ten minute presentation on this publication at a 'Roundtable of new scholarship into Agnes Martin' at Parsons New School in anticipation of the Agnes Martin retrospective opening in London in June. A recording of this event can be found here on Youtube. Roger's presentation begins at the twenty-three minute mark. 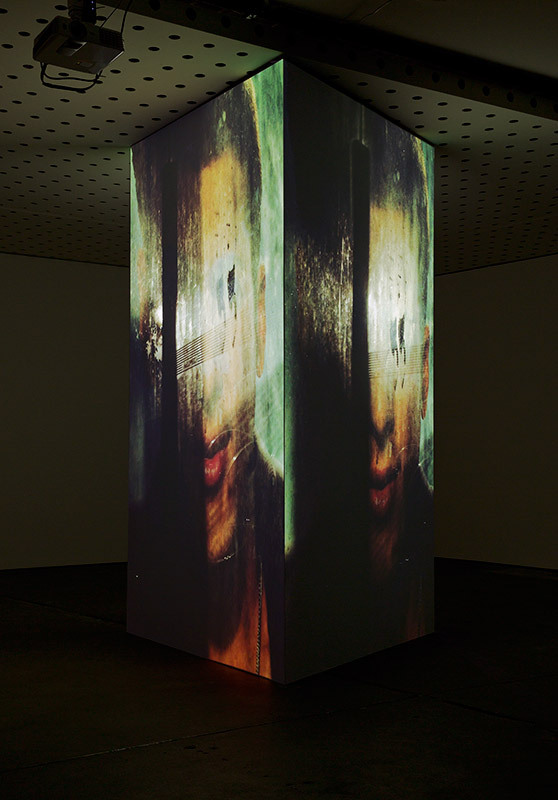 A five-channel digital video installation, with two-track sound, of mobile phone films across two rooms. The films, made in Lisbon & London, are hand-held, locked-frame, single-shots & unedited; the soundtracks, originating from one film in each space, are direct sound. single-channel mobile phone digital video (silent) | duration: 13min 25sec. 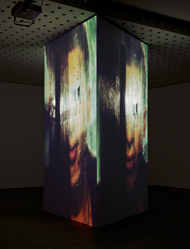 three-channel mobile phone digital video installation with sound. single-channel mobile phone digital video with sound | duration: shot held for as long as possible. Roger Cook / Libby Brown / Ti Parks. The CCP team, notably Naomi Cass, Kyla McFarlane & Joseph Johnson. Raafat Ishak / Annika Kristensen & ACCA / Milani Gallery / Lachlan Petras / Arlo Mountford / Brie Trennery / Daniel McKewen / Rowan Cochran / Gotaro Uematsu. Jurgen Bock & Escola Maumaus / Anne & Gordon Samstag International Visual Arts Scholarship. This project is supported by the Victorian Government through Arts Victoria.